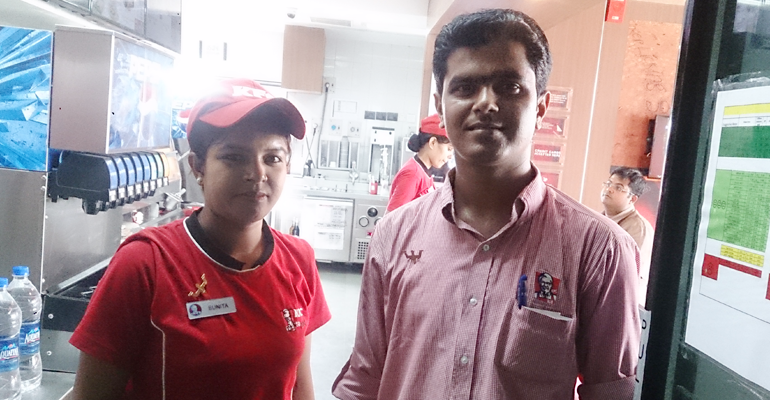 Hope is nothing but a certainty that makes a person strong in difficult times to have courage and use his/her time and efforts efficiently and after watching Sunita’s smile who is currently working in KFC ,a belief of hope renovates into reality. Sunita Devi father is a daily wage laborer and his wages have been sole source of income for the entire family of 6 people. Due to scarce family income, Sunita had to give up her dream of higher studies at the age of 16. Her parents were unable to provide her education after 12th Class. Initially she started working at a local government school with a mere salary of Rs 500/- per month, which itself reflects the state of family and sustenance. Clearly, this income was not even sufficient to bear her own essential expenses. With no other hope, she continued there for some time until she came to know about Himayat by the DB Tech team who visited their village during Mobilization. She later visited the centre and gathered all the information which she conveyed to her parents seeking permission to join the training program. Initially her parents were not willing to let her pursue the training, being afraid of sending her daughter faraway to work. However looking at the family’s pecuniary situation, they agreed. After seeking permission from family, Sunita joined the training program. After attending few days of Induction, she expressed her desire to opt Hospitality Domain for training. After counseling her, she was given her choice of domain. Her domain trainer Ms. Ishrat Shah shares, “I still remember, she came to me very calmly and requested for Hospitality Domain. After asking the rationale, she said, I love keeping my house and surroundings clean and this domain is somewhat similar to the work. An employment in this sector would be the work I love to do.” Observing at her striking personality, interest inventory scores and her keen interest in the sector, staff of Don Bosco Tech at Bisnah, decided to give her hospitality domain. Sunita was much disciplined but little shy at the beginning, however after training she turned confident and her personality groomed further for the industry. She already had valor and aptitude to succeed; I simply determined that how she will learn and taught her that way only. Today she is happily working in KFC, which makes me feel proud of her. She is earning a salary of Rs 6000 + Rs 2000 PPS. She shares most part of her salary with family and also saving some for herself which she will utilize in future. She says, I am saving some money to continue my education I future which will help me grow. Ms. Manpreet Kaur, the Centre Coordinator says, “Sunita and her sister had joined the training together, however Sunita was more active, enthusiastic. With her polite behavior, she cracked her first interview which reflects her competence as well. During training, she was an easy trainee to deal with. Her ‘always ready to learn attitude’ added the real essence in her personality. I must say her journey from an unemployed village girl to KFC is indeed a matter of success story.